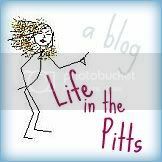 Life in the Pitts: Are You Pregnant?? Ha, I found this post in my drafts folder! I wrote it back in November. It definitely isn't the worst story I have about this question. Remember that time the guy at church refused to believe I wasn't pregnant, even though I had only been married for a few months and was still years away from getting knocked up? Well, this is nowhere near as bad. But still, pretty darn irritating. Wow, I don't know how to feel about this question right now. I am, but I'm only 7 weeks- it isn't the baby making me look like that! A big burrito and a large soda would have had the same effect. Last time I was about 17 weeks when my tummy had this shape. So, I get why you asked. But it's still frustrating. Let's make a pact, you guys. Stop asking this. Unless you see the baby kicking, or the mother is standing in one of those classic pregnancy poses, or you can see the baby crowning. Next time I'm going to say "Oh, no, I'm just bloated and really gassy." And then we can all feel awkward together. What are your experiences with this question? Have you ever been the one who asked, and then regretted it? Because, honestly, I have too. Or do you have a question you dread more?